Our photo guide, Yande was a taciturn man. On the first day of our photo shoot, we met in the 5am dark at the hotel’s entrance. He quietly greeted us, packed our camera gear and silently drove into the brooding night. Initially, I welcomed his silence. However, in the ensuing four hours of travel we exchanged less than ten words per hour. Forty words. Barely enough for a story stanza, hardly enough for a short story. 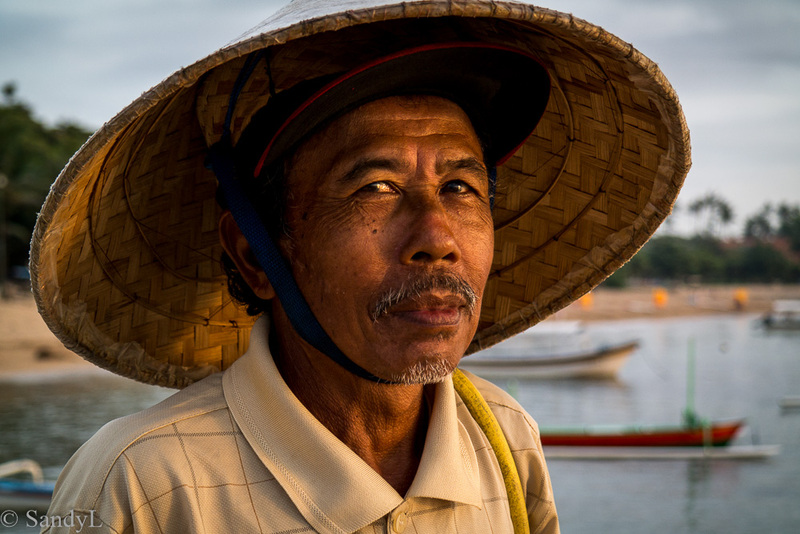 That day we had a sunrise shoot on Sanur beach with a local fisherman as a model. It was either his first time or a repeat of many similar times. Either way he was stiff and formal. He wore a cone straw hat and a pressed golf shirt neatly buttoned up. With awkward lassitude he stood against a rising turquoise sky. He held his fishing net with an arm stuck out, stiffly perpendicular to his body. It was a perfect silhouette of a one legged mail post. As the sun lightened up, we beckoned him on shore for portrait close-ups. With a stare reminiscent of mug shots and do-not-smite passport pictures, he stared blankly into the camera. On a whim, I showed him the pictures on my camera’s LED screen. In my next shot I noted a gradual easing of his cheek. The slight, almost imperceptible crinkle at his eyes. It was the beginning of a potential for a smile. Later I told Yande that one of my better pictures was a closeup of the fisherman. On our second day, Yande took us to the hills to greet the sunrise at Ulun Danu. On the way we were stuck in a narrow winding country road, in a slow moving cavalcade of cars and farm vehicles. At one point we were cut off by a motor bike hauling a makeshift bamboo trailer. In the trailer, precariously maintaining his balance, was a large pig. White exhaust belched from the bike’s muffler directly into the pig’s face and the trailer lurched and swerved around the many pot holes. In this stretch there were more holes than road and I wondered how the pig stayed upright. “That’s a happy pig,” Yande said. “Why? Isn’t he going to the butcher?” I said. Balinese homes have a feng shui type arrangement – walled compounds with a single gate for entrance and exit. Money and prosperity flows in and with careful watch, does not flow out. The unofficial gate house is the kitchen, where mother stands guard. Everyone must pass the kitchen. Even a daughter’s boyfriend. Especially a daughter’s boyfriend. 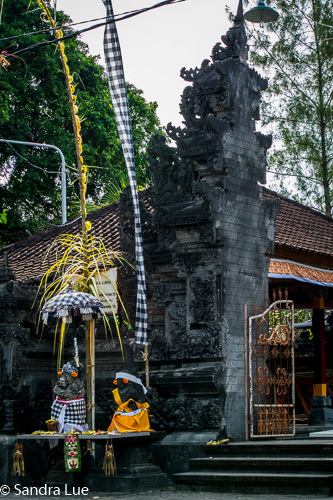 In the Bali compound a system of houses are arranged in strategic north-south, east-west placement. The parent’s house faces West, the grandparents’ faces East. The eldest son’s family home faces North and the tombs of deceased family members face South. Yande says that the North symbolizes youth and prosperity; the East, longevity. Longevity without wealth is not good. Wealth without longevity is even worse. North East is the best. Yande’s voice deepened with the weight of an observant son. Yande paused before deciding to tell us a story. “My uncle, my mother’s brother, is a second son. A long time ago he met two sisters and fell in love with the younger sister. She was very beautiful. He noticed though, that whenever he went to visit her, the older sister was always there. When it came time he wanted to marry the younger sister. But the girl’s parents said no, he could only marry the older sister. Although they were very rich, they owned two separate houses, they had no sons, only the two daughters. As an incentive, they said he could get the family home, if he married the older sister. Still, in his heart he loved the younger sister. After several years of marriage and the birth of his own son, he again approached the parents. Eventually they agreed and he married his true love. Today, he has two wives and two houses. Gates are a big thing in Bali. Large stone structures, they are ornately carved portals which loom eight meters high. 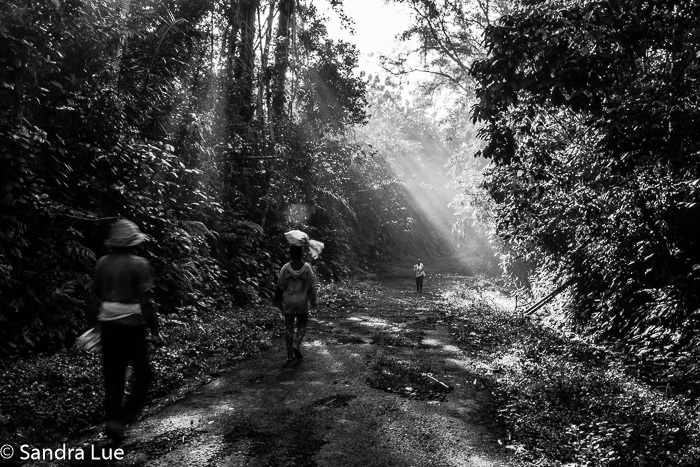 Yande said that the gates are built in the image of Balinese mountains because all life comes from there. Fresh water flows from the mountains and food grows abundant with seasons. On our last day in Bali, we walked along Jimbalan beach and watched the fishermen bring in their catch. It was scarcely 9 am, but most of the boats had been docked and unloaded for the morning market. Wiry and burnt brown from the unforgiving sun, the men cleaned their catamarans and untangled their fishing nets. When a late coming boat approached, everyone dropped their work and hurried to help dock the vessel. Lined up on either side, they hoisted the heavy boat onto a barrow trolley and pulled it ashore. With the waves bashing against the fully loaded hull, it took twelve men and nearly an hour of heaving to bring the boat ashore. My final shot of the Bugis is of two young men, classically posed against the breaking waves, patiently waiting for the boat to approach and begin the arduous work of bringing in the day’s harvest. Early morning in Dempasar market there’s no space for parking or for standing. Traffic flows and barely misses stationary pedestrians and photo shootists. Slippery sidewalks and walkways. Squashed fruit and murky fish water. Step carefully, not to avoid but to avoid sliding and falling. A porter lady rushes through with improbably long head cargo. Fleet and surefooted she hurries by.